We have recently finished the basement in our house, and paint color was an important final decision for this home improvement project. Depending on the type of room you are painting, there will be varied steps in your preparation process. For us, the basement walls were unfinished, so an initial priming coat was very important. As we were finishing the whole basement, we were able to use a paint sprayer to prime the entire room. In doing this, it was important that we securely taped and covered the areas that we did not want primed. Also important was the use of a full body painter's suit and a proper respirator and eyewear. This made the task of putting several primer coats on the walls and ceiling seem less daunting. One recommendation for this would be to make sure that you thoroughly clean out the lines and accessories of the paint sprayer. We have not used the sprayer since this project, and I know that I will find clogged lines the next time I try to use it. I will have to purchase new paint lines since I did not thoroughly clean them after the completion of this project. In choosing the final paint color, we put a lot of time and thought into it. We researched online extensively to see what other people did for their basements. From here, we could really see what we liked as well as disliked. Once we had a few main colors picked out, the next step was to do some test painting. To do this, we purchased some poster board and some small sample cans of the paint "finalists". We painted a foot sized swatch of each color on the different poster boards, and then we hung these in the room itself. Once the paint swatches were dry, we took our time in deciding which color to use. Having the swatches in the room where we were going to paint was very helpful. This way we could see the colors during different times of day under different lighting conditions. We used a chartreuse yellow paint color by Valspar (eggshell finish) for the walls, and a white flat latex paint by Olympic for the ceiling. We are very happy with how our basement and the paint color choice turned out. I think its beautiful and cheerful. 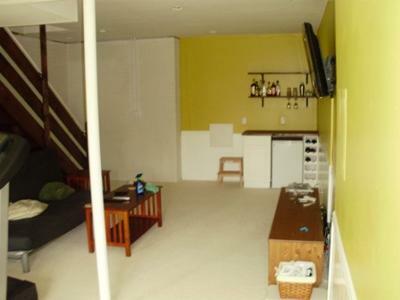 Not a "basement" color at all. Good for you!